We’d love your help. Let us know what’s wrong with this preview of Between Worlds by Skip Brittenham. Mayberry and Marshall have heard the stories about the Wishing Tree, but they know nothing like that could really e Immersive augmented reality brings this action-packed fantasy to life. To ask other readers questions about Between Worlds, please sign up. what age would you reccomend this for? I'm worried about it being a childrens' book and not being captivating enough. I'm in high school. I wish I could be teleported to another world through my local wishing tree. While it looks like it might never happen to me, Marshall and Mayberry, the main characters of Skip Brittenham's BETWEEN WORLDS, have that exact fate handed to them when they go to Eden Grove’s “Mystery Forest." No really, when they fall asleep next to a regular looking tree, they wake up in a completely new world full of crazy creatures they never could have even dreamed of seeing. However, it turns out that it’s tough I wish I could be teleported to another world through my local wishing tree. While it looks like it might never happen to me, Marshall and Mayberry, the main characters of Skip Brittenham's BETWEEN WORLDS, have that exact fate handed to them when they go to Eden Grove’s “Mystery Forest." No really, when they fall asleep next to a regular looking tree, they wake up in a completely new world full of crazy creatures they never could have even dreamed of seeing. However, it turns out that it’s tough to be a hero, and they are forced to learn how to control magic in order to survive, but also to play into a scheme they never could have imagined. In the midst of all the monsters who only want to use them, they find out more about themselves as they learn to control their magic. While accompanying them on their journey to get stronger and master their magic, I couldn't help but feel attached to them. Throughout the entirety of this novel, Marshall and Mayberry fight to control their powers and learn more about the place they were transported to and the beasts in lurking it. I loved that Marshall and Mayberry weren’t considered to be the most beautiful, perfect human beings on Earth. It was actually really refreshing, especially when a lot of authors are trying to add diverse characters into their novels, Brittenham really succeeded at doing so by adding characters that represented the average teen, and not some crazy agile warrior that most YA books seem to default to for their heroes and heroines. I tried really hard to fall in love with this book. It was all there: the relatable protagonists, an enchanting new world and even using augmented reality to show the story in a new light! But I just wasn’t drawn into the story itself. Sure, I loved the way Brittenham described the setting, the way the smallest details of the story were still acknowledged and loved, but I just wasn’t engrossed into it. For a young adult novel, BETWEEN WORLDS is exceptionally tame: there is not too much action, but there is still a great group of characters who show off the meaning of friendship in heartwarming ways. However, the augmented reality app that came with this book was probably one of the most impressive aspects of it all. When I got my copy, I got the free companion app and put my phone over the illustrations embedded between the pages of the novel. When I did, the picture came to life and a 3-D model popped out. Sometimes it was a tree and sometimes it was a mythical creature, but I could always interact with them by clicking on them and moving my phone around. I could also read entries from Mayberry’s journal or play mini games. It was definitely an amazing experience to be able to mash technology with my reading. AR technology is what makes this book a game-changer, and I hope to see it accompany more books in the future. That being said, I think that this book has promise, and seekers of an adventure who want to see what it’s like to add augmented reality to your reading experience should really check BETWEEN WORLDS out. BETWEEN WORLDS is a great introduction to fantasy novels for middle grade readers, but lacked the spirit of a young adult novel. In the book itself, the story is described by Marshall as "How My Girlfriend and I Found an Ancient Sentient Tree That Teleported Us to Another Dimension to Rescue a Boy Presumed Brain-Dead" (E ARC, page 254. ), and indeed, that is what the book is about. Aaron is the boy who manages to kill his sister by pelting her with snow balls until she runs onto a lake that isn't frozen all the way and drowns despite his best efforts to save her. He goes into the local "Mystery Forest" to try to find the Wishing Tree, and when he does, he wishes that if his sister can't be brought back to life, then he should be sent far away. Switch to Goth-wannabe Mayberry, who is stuck in the wilds of Minnesota because her mother is studied quaking aspen groves. She's so deliberately weird that people make fun of her, with the exception of Marshall, who has his own problems. The two try to find the Wishing Tree, thinking it would help Mayberry's mother out, and when they find the tree they end up getting sucked into a magical world that's just...weird. Like, acid trip weird. Once they come back, they figure out that Aaron is trapped in the world, and unless they save him (since he's been in a coma for two years), his parents will take him off life support. Here's the Kirkus Review. I'm going to pass. I received an advanced reader’s copy from MB Communications in exchange for an honest review. Between Worlds is the story of Marshall and Mayberry, two teens that stumble upon another world through a Wishing Tree. They head out into their town’s Mystery Forest, which is a thick aspen grove steeped in legend. After falling asleep beneath the wishing tree, Marshall and Mayberry wake up in Nith, a parallel world filled with fantastical creatures and magic. In a world rich with beings Marshall and Ma I received an advanced reader’s copy from MB Communications in exchange for an honest review. 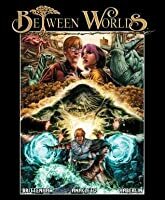 Between Worlds is the story of Marshall and Mayberry, two teens that stumble upon another world through a Wishing Tree. They head out into their town’s Mystery Forest, which is a thick aspen grove steeped in legend. After falling asleep beneath the wishing tree, Marshall and Mayberry wake up in Nith, a parallel world filled with fantastical creatures and magic. In a world rich with beings Marshall and Mayberry could have only ever dreamed of, it becomes difficult to tell friend from foe. But they’ll have to figure it out fast—as well as their newfound magical abilities—for there to be any hope of getting home. 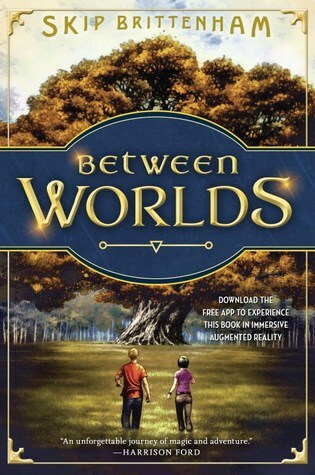 When I first heard about Between Worlds, the thing that caught me was the supposed ‘Augmented Reality’ that can be achieved with this book through an app. I raised an eyebrow at first, as these gimmicks can at times take away from the actual story. Before I even began the book, I opened the app and directed it at the cover. Basically, the app works through your camera, and when you point it at the book or certain pages within (any artwork page), 3D creatures pop up on the app. It looks as though they’re standing on the book, which I admit I was impressed by. There are, at times, more than one creature per page, and each comes with a diary style entry written by one of the characters to describe the creature and what it can do. The creatures also move and fight back if you poke them, which was very cool. It added a lot of information that is needed in heavy fantasy, but isn’t always easy to incorporate into the narrative without boring the reader. Not to mention that it brought the book to life in a way I’ve never before experienced. You had to read the book for these creatures to have any meaning to you, and as you read each artwork page you stumble upon gives you something new to look at through the app. So I was very pleased to see how the augmented reality complimented the story and encourages kids to read through, and not just sit on the app poking creatures all day. As for the story itself, the writing was very solid. The thing that really caught my breath, as is probably expected, was the world building. I loved the richness of creatures, as well as the fact that nothing in Nith looks human, even those that have intelligence or human traits. It felt fresh in the way that it explored the “kids falling into another world” idea. I find a lot of YA and MG that follow that trope have their main characters almost immediately find someone that wants to help them. Not so is the case in Between Worlds. Mayberry and Marshall had to struggle and survive very much on their own strength throughout the whole story, which really helped to build them into the kind of heroes you want to see in this type of world. The prose flows nicely and steadily, offering just enough background without slowing down the pace of the story. At the same time, the story doesn’t rush anything, allowing us to see Mayberry and Marshal’s world before they travel to Nith, which I believe is so important when you want to establish character growth. How do we know how the characters have changed if we don’t see how they lived before their harrowing adventure? It’s nice to see the contrast later, after Marshall and Mayberry return, and how much confidence they’ve gained. The only thing I could have asked for when it came to Between Worlds would have been something more for my heart to grab onto. The prologue starts off with Aaron dealing with the conflict of his sister’s death, but aside from that there wasn’t much inner conflict or motivations that really tugged at my heart. Mayberry goes off into the forest partly to help her mother in getting samples, but as we never get a chance to see her mother or their relationship, it’s hard to feel connected to her motivation on an emotional level. Even Marshall’s main motivation to go was because was he was her friend. Even when they struggled to get home, it was Aaron who brought on the heart wrenching idea of home baked cookies. There didn’t seem to be as much driving Marshall or Mayberry to get home. All in all, 4/5 stars. A gripping creature fantasy complimented by amazing augmented reality. I bought this book recently and I must say it was very very good. In fact it was so good I couldn't put it down except to go to the bathroom and eat and stuff. The book was ripe full of excitement and action. The main characters were great and it worked for them, the story I mean. Since I have the book and all it will be around and I will be reading it over again as do a lot of the books I have. It was that good. I really did not like this book at all. I'm not sure why I kept reading. Had potential with no follow through. Lacknof plot. In the forest is an aspen tree said to grant wishes. When Marshall and Mayberry encounter it, they end up in a world full of strange creatures, magic, and danger. Can they survive? This was stuffed with all the things I usually enjoy, but maybe because of that I never connected much with anything. It was too much, too fast. Or perhaps I just didn't feel enough of a connection to the characters or the world to really care about what happened to either. The illustrations are easily the best part. Ev In the forest is an aspen tree said to grant wishes. When Marshall and Mayberry encounter it, they end up in a world full of strange creatures, magic, and danger. Can they survive? The illustrations are easily the best part. Every few chapters another full page color illustration showcasing a nearby scene. The pictures really help to bring some of the strange creatures to life. The characters are generic. Mayberry is the "too cool for the country" new girl, and Marshall is the dork with no self-confidence. Both of them are outcasts, and pretty much the other's only friend. They feel similar enough in the prose that I had a hard time telling them apart; other than surface details it felt like most of what one of them did the other could've done and it wouldn't have made a difference. And the fantasy world would have been better if we didn't have Marshall and Mayberry mastering magic in the space of a week. There's no attempt made to explain what magic is or how it works, which I could live with if it didn't feel so haphazard. These kids have never seen magic before, but after only a week they can do complicated magical tricks like lighting multiple sticks on fire at the same time or calling up gigantic waves from nowhere? And all it takes is chanting a few words and twisting your fingers a certain way? Same with the familiars just showing up and instantly being best friends, because the prose doesn't have time to be anything but bare-bones. We have multiple intelligent races, there's some kind of war going on, here's a magical weapon that's the source of all magical weapons, etc. And then the way the book ties up it doesn't feel like it wants a sequel, so whatever this world is and whatever relation it has to ours doesn't seem to matter either. It was frustrating because I wanted to like this more than I did. Instead it felt like a firehose of fantasy trappings without ever getting enough depth to make anything stick. It's not bad. It's just that I'm more likely to remember the pictures than anything in the plot. I rate this book Neutral. This is my first time reading one of Brittenham's works and my experience was ... conflicted. So this story is about three kids who get teleported to a magical world called Nith through a giant aspen tree. Together, they must find a way back to Earth in one piece. In a nutshell, the whole concept of Nith and the aspen tree was pretty great. I truly enjoyed the colorful world of Nith and the different species of creatures. That being said, I believe my main issue with this book was both the plot and the characters. The plot was pretty much reactive the entire time. The characters didn't really get a chance to truly think for themselves. What was happening in the book seemed to just guide them to the right conclusion. Out of all three characters, I think Aaron is probably the most realistic due to what led him to the tree in the first place. Mayberry seems to be some kind of cliche, and Marshall was alright but nothing special. To make things worse, a lot of times Mayberry just seems to "know what to do". It even says it like that in the book. And somewhere down the line, Marshall suddenly becomes an expert hacker. Not believable, not at all. The plot is reasonably interesting, but the prose is clunky and amateurish. The author makes some effort to flesh out the characters and portray them as modern teenagers, but he comes across a little like a dad trying desperately to be cool. I read the whole story and enjoyed the plot, but I can't help think Brittenham may have got himself a book deal based mainly on his background in entertainment. He certainly needs to polish up his prose style, but I think he has some potential as a fantasy au The plot is reasonably interesting, but the prose is clunky and amateurish. The author makes some effort to flesh out the characters and portray them as modern teenagers, but he comes across a little like a dad trying desperately to be cool. This is a fun read, especially when integrated with the AR app, which works beautifully with the 12+ color pages throughout the novel. Marshall & Mayberry are great characters and though I wouldn't say that the writing is the best part of this novel, it's still an exciting fantasy read and students will love to play with the AR app (which is also interactive). This would be a good choice for a reluctant reader. This book gives a great idea of what parallel universes could be like, especially in the regards of how one might get there. In this one, it would seem that the tree is the device to travel. I am curious what the sand and walking stick could do, though. Would be interesting if there were a sequel. Had to read it for class. I couldn't even get through the first 30 pages and I had to skim/Google the rest. It's horrible. Writing, characters, story.. all of it. I swear the author paid his way into getting it published. I thought this book was really interesting, but I think it was missing something. The plot was good but it wasn't as exciting as it could have been. I liked Mayberry and Marshall, they were pretty cool.The ending was good too. The Augmented reality stuff was cool on the app too. It was really slow for the most part and didn't get interesting or hook me until towards the end. When it did get interesting, though, I enjoyed it. Posted first to Blog Critics as Book Review: 'Between Worlds', An Interactive Novel by Skip Brittenham. Between Worlds by Skip Brittenham takes us into an entirely new action packed and interactive work of imagination. Eden Grove seems like a sleepy town, a place to raise children and escape from the stress of larger areas. In the enter of the forest that surrounds it, an aspen grove finds it home. The trees are ancient, and have been a part of the lure of the area, once even claimed to hold a wi Posted first to Blog Critics as Book Review: 'Between Worlds', An Interactive Novel by Skip Brittenham. Between Worlds by Skip Brittenham takes us into an entirely new action packed and interactive work of imagination. Eden Grove seems like a sleepy town, a place to raise children and escape from the stress of larger areas. In the enter of the forest that surrounds it, an aspen grove finds it home. The trees are ancient, and have been a part of the lure of the area, once even claimed to hold a wishing tree. But as the years passed and moved on into the current time, those stories became rumors of old. Marshall and Mayberry are teenagers, bored and restless at the inadequacy of small town living. They have heard the rumors but know that such talk is not true, yet they yearn for excitement and their chance to be a part of something larger then themselves. When they decide on a hike into the forest, they suddenly find themselves in a place of importance. As they come to the aspen grove and continue into their hike, they find a tree that appears much older then possible, large and imperious, out of place in a way that seems odd. Wondering if somehow they have found the wishing tree, they determine to make their wishes—just in case. Sleep overtakes them as they lay against the behemoth tree, and when they awake they find themselves in a world different then their own. Can they be the heroes they dreamed of? What they find is that such magic takes a toll, and danger is a part of this world of mythical creatures. Death is possible and they see first hand that being a hero is more work then they can imagine. Can they make their way back home before they end up in this new world forever? Brittenham has given us an alternate reality that is different then those that have come before. His world is full of beauty but also littered with beasts of terrible ferocity. As in most worlds there are good and bad characters, but his small deceptions make is difficult to tell between the two. His descriptions of this world are well thought out, and make you feel as though you are there. His characters are full of curiosity and bravado, but all the same are teenagers in their old world with all the insecurities that come along with it. He is able to help you feel the connection and you experience their fear and concerns as you your are transported into this strange new world with them. Along with this work comes a free App, that can help you and your young reader view the world even closer. Full of pictures this book is a work of fun and involvement. If you are looking for a book to entrance your young reader this would be a great find. It is full of mystery, danger, heroic adventure and is tied in with new technology as an added enhancement. This is a tale that holds your attention, and is a great read for both the young adult and the young at heart. I can't wait to see what other adventures Brittenham brings. Between Worlds is a middle grade adventure story which features AR technology throughout the book. You can download an app that works with the book, which brings the pages alive. I love how books are starting to incorporate unique ideas to make reading a whole other experience. But as much as I do love technology, I think for the most part reading should just be reading without extra bells and whistles because there's nothing better than an imagination plus a good book. I guess I feel like inste Between Worlds is a middle grade adventure story which features AR technology throughout the book. You can download an app that works with the book, which brings the pages alive. I love how books are starting to incorporate unique ideas to make reading a whole other experience. But as much as I do love technology, I think for the most part reading should just be reading without extra bells and whistles because there's nothing better than an imagination plus a good book. I guess I feel like instead of enchancing it, it takes away from the reading experience for readers who may get distracted easily such as young readers. Even though that's just my opinion, I really think kids will love it to pieces. I showed my young daughter and she was so fascinated by the concept. Anyway, Mayberry and Marshall are two teens who end up stumbling upon a wishing tree in an area called Mystery Forest. There is an aspen groove which the local town council named Mystery Forest. Since so many people get lost there you gotta have a permit to get in. After falling asleep under the wishing tree, they wake up in a magical world occupied with creatures. The thing I loved most about this book is the world. The world is what makes adventure stories so fun! It was really fast paced (once it really got going) and it ended up being such a quick and fun read. I did like the writing style, but I feel like since the main characters were teens the writing was a bit too simple. As far as the characters, I loved that they were just simply average. A lot of times with middle grade or ya, you get characters who are perfect (but they just don't realize it if you know what I mean). However, Mayberry and Marshall were just two normal teens who had a hard time fitting in with the rest of the crowd. I think they are very relatable! Ultimately, I really enjoyed Between Worlds but it didn't blow me away or anything. I think younger readers who are new to the fantasy genre would enjoy it a lot though. I typically lean toward more darker books so I think that's why I had a hard time getting completely engrossed in the story. Anyways, if you are looking for a light middle grade fantasy with a cool world this one is for you! This is a great book that I highly recommend. Very intriguing and unique. I loved the pictures and the augmented reality! BETWEEN WORLDS by Skip Brittenham harkens back to many classical fantasies in that there is a secret, seemingly mundane portal ready to transport people to another dimension. In this case, it is a large aspen tree that sends two young teenagers to Nith, a place full of dangerous creatures who are looking for their next meal, and also a place where humans possess magic. Mayberry and Marshall, the two protagonists, must learn to harness their powers and navigate their way through Nith if they hope BETWEEN WORLDS by Skip Brittenham harkens back to many classical fantasies in that there is a secret, seemingly mundane portal ready to transport people to another dimension. In this case, it is a large aspen tree that sends two young teenagers to Nith, a place full of dangerous creatures who are looking for their next meal, and also a place where humans possess magic. Mayberry and Marshall, the two protagonists, must learn to harness their powers and navigate their way through Nith if they hope to return home to Eden Grove alive. BETWEEN WORLDS is an easy and quick read. The pacing throughout is consistent, keeping the book moving in a forward momentum. Additionally, the two lead characters are compelling and relatable. They are misfits in their small school and are often bullied for being “different.” Looking to find their niche in the world, luckily, they happen to find it in each other. Mayberry is very smart at science and math, while Marshall is a tech whiz. Together, the two of them are resourceful and make a great team. Overall, BETWEEN WORLDS is a sweet tale that is peppered with adventure. It should do very well with the late elementary to middle school readers who enjoy using their imaginations. In fact, the book itself has a complementary app that can be downloaded on an electronic device and allows the reader to experience the story in an immersive augmented reality, making this novel very much a product of the twenty first century. There are also accompanying color photos throughout the book that help in depicting the foreign beings the author describes. I personally wanted a slightly more complex plot as the protagonists were on the run for a decent portion of the book, which did not always contribute to an overall purpose. However, with that being said, anyone on the market for a light and fun read will not be disappointed by BETWEEN WORLDS. Between Worlds by Skip Brittenham is an interesting fantasy for young readers, roughly middle school age. There is also an app that is available "to experience this book in immersive Augmented Reality." The first part of the book was a little slow for me but it keeps just enough interest to keep reading while the alternate universe is established and background information is shared. The story picks up when two of the young people have to struggle to save themselves and another boy stuck there. T Between Worlds by Skip Brittenham is an interesting fantasy for young readers, roughly middle school age. There is also an app that is available "to experience this book in immersive Augmented Reality." The first part of the book was a little slow for me but it keeps just enough interest to keep reading while the alternate universe is established and background information is shared. The story picks up when two of the young people have to struggle to save themselves and another boy stuck there. The potential for sequels are there which would justify the slow start (some). The addition of the smartphone app can be viewed from a couple of perspectives. One is to consider it a negative and a gimmick. That is likely a more prevalent feeling among readers my age who may lament the intrusion of technology into the world of reading. There are certainly arguments for that view but I can't state them very well because I am not looking at it from that perspective. My teaching experience was at university level and augmenting texts has always been a positive thing to increase student engagement. The elementary and middle school teachers I know and asked about this idea were largely supportive as long as it wasn't simply a way to coax more money. If it helped to make the young readers more likely to read future volumes or perhaps encourage them to be creative and write their own stories in this new alternate world then the idea seemed to be well-received. Those feelings reflect my own but the teachers engaging children that age expressed it far better than I could. I would recommend this for young readers who like fantasy. This seems like a lighter form than many fantasy series so this might get readers at a slightly younger age or those hesitant to open a more daunting book. I did not explore the app so can not comment on the content or uses of it. Full disclosure, I was doing the augmented reality (AR) on my iPhone, but it would have been so much cooler on a tablet, for sure. So if you're going to take advantage of the AR aspect of that, that might be a helpful tip for you. Secondly, this is geared towards the middle school crowd (12+) but honestly, my third grader (age 8) got into it easily so if you have a child who can read at a 4th grade level and up, this might be a good pick for them. The story itself is pretty interesting, we have Full disclosure, I was doing the augmented reality (AR) on my iPhone, but it would have been so much cooler on a tablet, for sure. So if you're going to take advantage of the AR aspect of that, that might be a helpful tip for you. Secondly, this is geared towards the middle school crowd (12+) but honestly, my third grader (age 8) got into it easily so if you have a child who can read at a 4th grade level and up, this might be a good pick for them. The story itself is pretty interesting, we have two kids who find themselves in another world courtesy of the Wishing Tree. (So it's kind of like The Magic Treehouse for big kids) So Mayberry and Marshall find themselves in Nith, and they don't know what/who are friendly and what/who is an enemy. They discover they have some new magical powers, and they discover that there are some downsides to possessing these powers. They have to navigate this new land and test the limits of their strength and courage. The very cool thing about this book are the creatures in Nith, the author does a fantastic job of imagining them up and giving us some really fantastic descriptions. (Then you add in the AR piece to the book where the characters essentially pop up off your page and it really just adds a very cool element.) And we have a budding junior high romance between Mayberry and Marshall which was very sweet and not too much for this age group. The imagination behind this is fantastic. It reminded me of little Brenda; the one who was constantly writing fantasy stories during those extra minutes in class. It was always centered on a portal to another world where all manner of fantastical beasts lived. Between Worlds was exactly like that. Mayberry and Marshall enter a world through a giant magical tree and cause all kinds of hullabaloo. Obviously, Nith is the star of the book. The creatures we were exposed to on Nith were awesome, gargan The imagination behind this is fantastic. It reminded me of little Brenda; the one who was constantly writing fantasy stories during those extra minutes in class. It was always centered on a portal to another world where all manner of fantastical beasts lived. Between Worlds was exactly like that. Mayberry and Marshall enter a world through a giant magical tree and cause all kinds of hullabaloo. Obviously, Nith is the star of the book. The creatures we were exposed to on Nith were awesome, gargantuan, and usually pretty hairy. Everything was out to eat Mayberry and Marshall, which made this fairly small story jam-packed with action and adventure. Really, I saw more in this one small novel than I did in the first three books of the Raven Cycle series, and had infinitely more fun reading while doing so. The blossoming relationship between Marshall and Mayberry was surprisingly sweet. Two oddballs finding refuge in one another while proving their worthiness through each obstacle. Fending off tentacled monsters while proving their affection. I adore all aspects of this. I really loved the Aaron's story, too. It was the perfect uplift and added a little more depth to an already great book. Reviewed for School Library Journal August 1st, 2016 issue. Gr 6–9—Years ago, the residents of Eden Grove were encouraged to create stories around "Mystery Forest," an old aspen grove outside of town. One of the more enduring tales was that of a tree located in the exact center of the forest that would grant wishes. When Mayberry, a recent transfer student to the high school, hears of this wishing tree, she is intrigued. Her one and only friend, Marshall, a fellow social outcast with a secret cru Reviewed for School Library Journal August 1st, 2016 issue. I got a free copy of this novel in exchange for an honest review. Here it is!! This book was a quick, action-filled, fantasy novel. It involved three likable human characters, a bad guy (no idea what kind of creature he is), an alternate universe/world, merlin's wand, and some adorable familiar animals (pets) for each human. I loved them more than the humans, tbh, but the protagonists and their adventure was fun to read about. A little unrealistic and very lighthearted, this wasn't my favorite bo I got a free copy of this novel in exchange for an honest review. Here it is!! This fantasy has over-the-top fantasy characters, which was off-putting for me, and more description than I care for. That said, the fix these likable characters get into is a dangerous, fast-paced ride right up to a satisfying end. I liked this book, but I didn't love it. It kept me turning pages, but Nith felt bizarre and the characters didn't have much motivation. The illustrations were cool though.